Judy Stone and her sister from Columbia, Janet Bailey; Linda Clancy and her sister from Alabama, Gloria Puliat—walked in the Charlotte Avon Walk for Breast Cancer. The Charlotte Avon Walk for Breast Cancer took place on October 27-28 for a total of 39.3 miles–a marathon walk on Saturday and a half-marathon on Sunday. The walkers were fed a hot supper and slept in pink tents Saturday night before setting out the next morning for the final 13.1 miles. The Charlotte Avon Walk for Breast Cancer raised a total of 1.75 million dollars! There were approximately 1200 walkers that started out Saturday morning with some only walking part of the weekend. The weather was ideal for the walk, and the route was often scenic with beautiful fall foliage as we wound through parks, neighborhoods, and downtown streets. With a lot of support from the people of Johnston United Methodist Church and others in the community, our team “39.3 or BUST” ended up raising around $7400 by the end of October. The Johnston United Methodist Church women’s circle provided baked goods all summer at the Farmer’s Market for this worthy cause. Other sources of donations came from a soup and sandwich fundraiser at the church and numerous on-line donations through facebook and emails. The Avon Company uses the money we raised for women who have breast cancer and have no insurance, are in rural areas or are medically underserved. It gives all women access to high-quality care. Of course, early detection is the key to a cure. Mobile Mammography vans travel around the country providing this care to women. During the walk on October 27 and 28 we all wore the pink ribbon sashes that said “EVERY THREE MINUTES”. Every three minutes one person is diagnosed with breast cancer and one person dies of breast cancer approximately every 14 minutes. 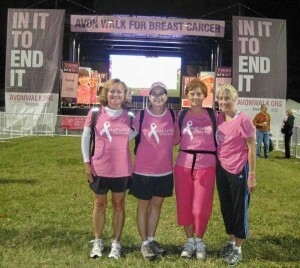 Judy, Janet, Gloria and Linda were proud to raise the money and walk the walk for a wonderful cause.